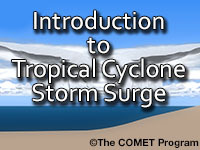 This lesson introduces forecasters to the physical processes and impacts of tropical cyclone storm surge. It provides an overview of the factors that affect storm surge, how it is measured, and the limitations associated with storm surge data. I work in a coastal town with all of the pitfalls that go with it. I probably knew most of the info in this webinar, but some things I thought I knew were wrong. I always look to gain new information, and this webinar helped. The quiz questions confused the issue about total storm surge. This is a great lesson that is rather simple to comprehend and increases one's knowledge on he topic significantly. como meteorologo es muy importante para mi ya que vivo en una isla la cual esta en la avenida de los ciclone tropicales y concer del tema. This module gave me an excellent summary of the factors that influence tropical cyclone storm surge and was very helpful for the hurricane tracking that I do as a Storm Chaser. An excellent place to start learning about Tropical Storms off the North Carolina Coast - Thank you. I was frustrated after taking the quiz 4 times since I couldn't figure out the answers to the questions I kept missing; even with the lesson printed out, I was unable to come up with a right answer for 3 questions. The information provided should be a little more "meaty". I don't know if it was supposed to have sound, but I did not get any. This topic is informative. Storm surge was explained in a more understandable way. For a novice, this course was fairly intuitive, and should not be rushed through. I enjoyed taking more than the stated time to complete it as well as the quiz. Thoroughly enjoyed this module. Great introductory lesson for people with interest in storm surges. Explain how tropical cyclone size, intensity, motion/speed, angle of approach, coastal shape, and bathymetry affect storm surge. tropical cyclone, storm surge, vulnerability, coasts, coastlines, inland flooding, coastal flooding.